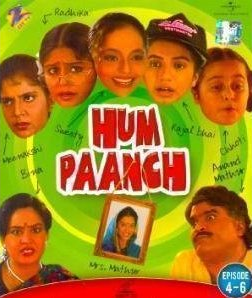 The Episode #2 of Hindi TV Serial Hum Paanch is focused on the incidents took place at Anand Mathur’s home in absence of his wife Beena. Actually one of Beena’s relative is not well so had to go to visit him. 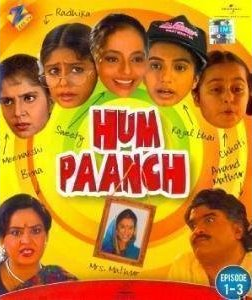 Priya Tendulkar got a role where she needed to act using her face mainly. As we know she is playing first wife of Anand Mathur, who is no more. But she is present in the hall of the house in a photo frame. She oversee and enjoy most of the events took place in the house from there and actively input from her side when she feel so!! She is a nice actress and probably the best choice for the role. This episode takes on satirically on various aspects of the society. Be it so called fashionistas or social workers. Well there is no point in saying that all of them are doing wrong or taking advantage of the situations. There are so many of genuine fellows in each field and we must and we do appreciate them. But this is a take on those who are doing social work for the sake of publicity or something to do (when they have nothing to!). There are people who like to represent that they are well aware of latest trends in the world of fashion and beauty and use heavy words and their limited knowledge to prove that. The episode is a take on them. Women Empowerment – the phrase is so meaningful and right, but not all who are using it, genuinely know what it is and what it means. The episode have something to say on that as well. As Beena is absent, we see that Meenaxi alone is doing all the work in the home. She got tired as she have to look after from ironing cloths to making food for everyone. Her dialog reminds us that how much work a housewife has to do (and she does) during the day. The small one line dialog is eye opener for those who think that a lady staying at home has nothing to do but take rest and watch TV only! It is not the case anyway (for most of the middle class housewives at least, who in most cases works more than her husband can do in two shifts of job!). We may wonder that as there are five sisters in the home so why Meenaxi has to do all the work alone!? The answer is simple. Majority of fellows are opportunistic and find ways to get away from work and responsibility. Those who don’t want to do anything, can found a reason for the same, very easily. We see such character not only in government offices (where there are genuine hard-working employees work as well) but also in almost all the segments of the society. Radhika’s exam is approaching so she turned off her hearing aid and closed herself in her room for reading. As Anand Mathur says -“she is using her blessings in disguise“. Sweety put on Heena on her hands so she cannot do anything!! Chotti is smallest of the lot and Kajal is well, she is Kajalbhai and how can one expect her to work!? She doesn’t even have curtsey to give a glass full of water to her father, what else can be expected from her?! The maid of the home – Sakhubai – is not coming since last couple of days and hence dish washing and other work is pending since long. At one moment she came and by seeing some mark on her face Sweety thought they were beauty spots and started inquiring about the same! We, thus, got to know that actually before a day her husband asked her for money to purchase liquor but she protested and hence her husband had beaten her! Now this is something wrong, of course. Meenaxi think of this event as an opportunity to stand against the wrong doings of men to women! She humbly asked Sakhubai to let her know the factual details of the incident and demonstrate the same!! She then decided to take support of some organizations who raise for such women and help them get justice. What happens this point forward is funny, eye-opener, satire look on real incidents mixed with fantasy! If to talk about acting Bhairavi excels. The lady playing Sakhubai is first rate. She her body language when she set on the sofa while conveying her details to Meenaxi! Rakhi Tandon is first rate as well. Amita Nangia doesn’t get much scope in this episode. Vandana Pathak and Ashok Sharaf leaves an impact. Guddi Maruti is the perfect choice for her role. See the facial encounter between Anand Mathur and Manoram, it is good piece of acting. Also hear the thoughtful dialogs between Anand and Meenaxi, where Anand tries calm down Meenaxi and tells not to provide wind to the fire in anyone’s house. The script and dialogs are the heart of the episode. Some scenes are not very funny but they are more realistic then. The set is authentic and represent an upper-middle-class family’s home properly. The background music is a positive attribute to the episode. The end is something which might not be loved by everyone, but it surely gives the message that (in most cases) husband and wife are a single unit and no rivalry can be there between them (when they by heart actually like each other). And the fear of losing one will make the other to surrender. The DVD quality is good and sound is remastered which is of nice quality now. Of course the current audience is used to watching rich family dramas may find the stuff a little dull, but it represent the majority of the people living in the real world. The other good thing is, you can watch it with your entire family without hesitation; which, according to us, is a great attribute of any TV Serial. Our personal verdict: You can surely go to watch the episode. It is not going to burst you into the laughter(s) but definitely irk some genuine smiles on your face.